She's never more "Virginia Foxx-like" than when she's voting with an abject minority on an issue that even her own Republican caucus mainly supports. In this case, the "Senior Financial Empowerment Act," legislation aimed at protecting seniors targetted by fraudsters and financial criminals. According to the Federal Trade Commission, nearly one in five seniors are defrauded each year. Too damn bad! sez Madam Foxx and 78 of her closest bosom buddies in the Republican caucus. A total of 79 Republicans (and two obscure Democrats) voted against the bill. Even that Oompa-Loompa Patrick McHenry from the NC-10 voted FOR it! 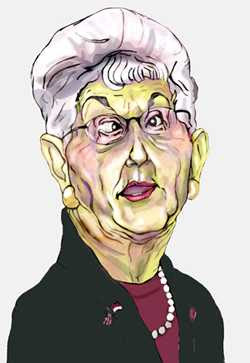 Virginia Foxx is famous in my household for having once said (while she was in the NC Senate), "The worst thing we can do is to get government involved in solving problems." That goes for providing information about companies with a track record of defrauding elderly people to those seniors' children or care givers. It's a modest fix for a crime wave that nets some $2.6 billion a year from unsuspecting and sometimes befuddled older citizens, and it involves zero government spending. Who could be against such a thing ... except Madam Virginia Foxx, the New Queen of Mean. The reason we missed this vote is that it happened on the same day that Madam Foxx even more egregiously voted against the "James Zadroga 9/11 Health and Compensation Act," which would have given free health care to the first responders and rescue workers at Ground Zero on 9/11. One more cruel vote in Congress distracts us from the first cruel vote. What a peach of a human being this woman is! The bill is not to save teaching jobs. It is to subsidize pensions for teachers and to secure votes for the left from teacher's unions. Give it a rest. You NEED a teacher! Anyone who attempted to teach you DESERVES a pension! !